There is no doubt that the British Virgin Islands (BVI) are the sailing capital of the Caribbean. With more than 60 islands and cays the BVI offers an endless range of possibilities. Attractions range from the bustling streets of charming Road Town to the amazing rock formations of The Baths and from funky beach bars to pristine anchorages with breathtaking diving and snorkeling sites – all in all – something for everyone. The waters of the BVI are well protected and easy to navigate and fanned by the trade winds, the emerald green islands make up a sailors Paradise. There are more than 100 anchorages and secrets waiting to be discovered, sailing in the world’s largest infinity pool. Walk the endless beaches of Anegada, snorkel the caves at Norman Island or dive one of the many wrecks. There are so many things to do! If you have no sailing experience, the British Virgin Islands are also the perfect place for your first unforgettable adventure on a catamaran, sailing or motor yacht. There has more than 200 crewed charter yachts and their crews would all be happy to introduce you to life on a “Floating Boutique Hotel” and pamper you beyond your wildest dreams. If you can helm your own boat, you can charter a bareboat and explore some of the many bays by yourself or participate in one of our many regattas! The British Virgin Islands still have the Caribbean charm and we promise you a great adventure. Only 27.000 people live here and only 4 islands have more than 100 permanent residents. There is only ferry connections to a couple of the islands so you can easily find your own spots with the same view that Columbus had 500 years ago when you charter your own yacht. There are also many activities from surfing to kayaking and the BVI is also a great stop for kite-boarding. The British Virgin Islands are easily reached by either a short half hour flight from Puerto Rico or St. Maarten. If you are flying into St. Thomas in the U.S. Virgin Islands, a scenic one hour ferry ride will bring you to Road Town, Tortola. Enjoy a yacht charter in Paradise! We’ll are based right here in the BVI and know all the yachts and crew. 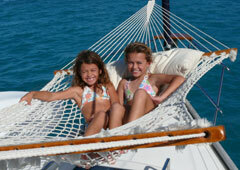 Please CONTACT US for more information on BVI yacht charters.